Which round is better the 30-06 or the .270 Win? There are slight differences in the 2 cartridges that make a good bit of difference at different ranges and against different game. Both the .270 and the 30-06 are top notch deer hunting rounds that have stocked freezers everywhere with tasty venison. Both the 30-06 and the .270 have decorated many a man cave over the last 50-100 years. Discussing the 270 and the 30-06 is akin to talking about the Yankees and the Red Sox. You’re bound to step on a few toes in doing so. So I ask you to kindly put down your pitchforks, torches, lynch ropes, lower your guard a bit, and let’s take a subjective look at the external and terminal ballistic data ranges that these 2 rounds create. What am I personally looking for in a rifle? I need a rifle that will shoot out to 300 yards at most as I live in the foothills/mountains of North Carolina and finding a 300 yard+ flat straight clearing that isn’t a road is rare. You can see from the cartridge specs and artist renderings that the 30-06 cartridge is a hair slower, shorter, has more recoil, and has a bit less energy. So the external ballistics of the 30-06 trajectory put it slightly behind the .270 Win, and we haven't even started looking at the drop charts. However in terms of terminal ballistics (on impact) the 30-06 is the winner at closer ranges (150 yards and under). The larger 166gr bullet will have larger permanent cavitation, and being slower there is less chance of over penetration on larger game. Average: The averages listed above are averages of all known cartridge variances listed in our bullet database. It's the #1 deer round used in the United States, and possibly the world. We say possibly because we really don't have the stats on this round to state it's global appeal. 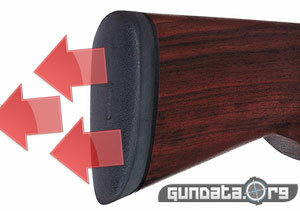 The .270 Winchester was designed somewhere in the 1920's and was released by Winchester. The round was moderately popular for hunting medium to large game and was based of either the .30-03 Springfield or the .30-06 Springfield depending on your sources. I wasnt alive back then so I have to rely on my sources. Either way the .270 is a modified 30-0? Springfield. 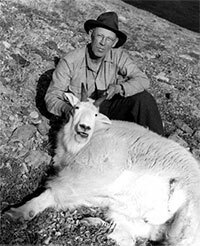 The writer Jack O'Conner a writer for the magazine Outdoor Life was a huge fan, and he was by far the leading voice for this cartridge. So helpful was he in the promotion of this round that Winchester created a wonderful looking mantle gun called the Winchester Model 70 Jack O'Conner that only comes in one round..you guessed it... the 270 Win. 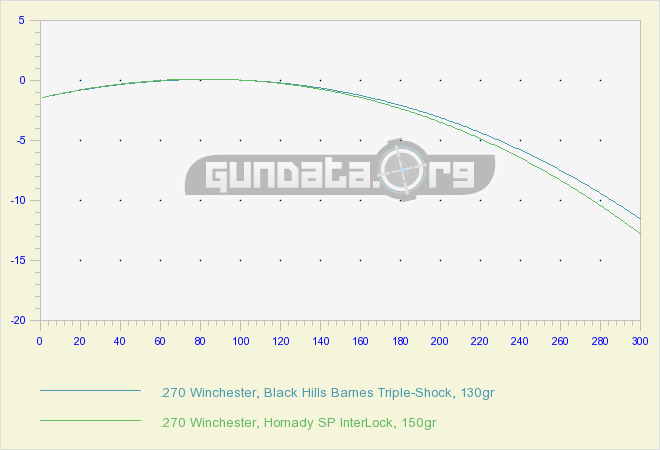 See the review of the Winchester Model 70 Jack O'Conner and see the photos. If you had 2 identical rifles one in 30-06 and one in 270 Win the 270 will have slightly less recoil with a relative recoil factor of just 1.82 compared to the relative recoil of the 30-06 at 2.19. So the 270 is a slightly less punishing round that should allow for faster follow up shots if need be. Now this will not always be the case if the rifles are different. A lighweight rifle with an old wore down pad in 270 win might feel like a sledghammer if compared to a 30-06 in a heavy rifle that has a brand new pachmayr recoil pad. The 30-06 wins here. 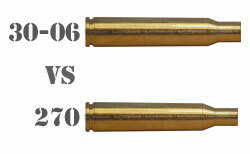 The 30-06 has a much larger range of bullet weights than the .270 Win. You can find 30-06 ammo in 130 grain all the way to 220 grain (range of 90). The 270 Win only ranges from 100 gr to 150 gr (range of 50). The 30-06 is also cheaper by a few dollars on the premium boxes of ammo. So the 30-06 wins on price but not by much when talking about purchasing ammo. Since we don't reload we didn't do any research on reload costs, but would assume them to be similarly equal. The 30-06 is also slightly more available than the 270 win, although both can be found at all major retailers and online ammo shops. Since our goal is 300 yards and less we drew a chart using our ballisitc calc tool. This assumes we are sighted in at 100 yards, and our scope ads 1.5" of height. This is just a random selection of 30-06 rounds. Again since our goal is 300 yards and less we drew a chart using our ballisitc calc tool. This assumes we are sighted in at 100 yards, and our scope ads 1.5" of height. This is just a random selection of 270 rounds. To say that the 270 Winchester has a flatter trajectory than the 30-06 isn't always 100% true in terms of real world performance. It really depends on which rounds your are comparing. Our cartridge database is large enough that we have several instances of the same grain, and same manufactuer for both cartridges. These cartridges perform near identical. The only difference is the ballistic coeficient and the initial muzzle velocity. 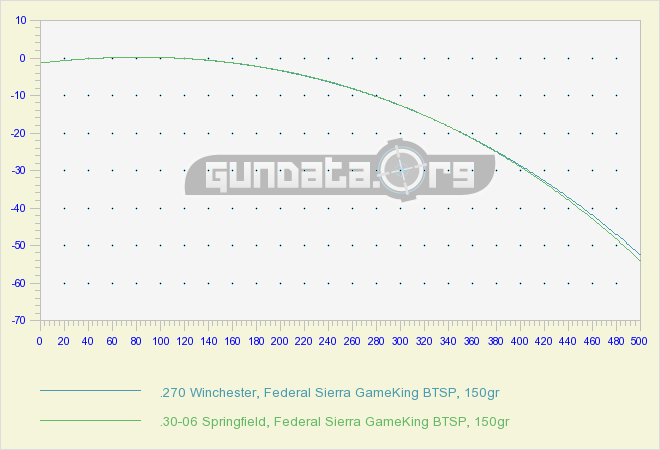 An example that favors the 30-06 is the .270 Winchester, Federal Sierra GameKing BTSP, 150gr and the .30-06 Springfield, Federal Sierra GameKing BTSP, 150gr. The difference in drop at 300 yards is 1/10 of one inch. (a tenth of one inch), and at 500 yards the 270 win is sitting just 1.5" (one and a half inches) higher than the 30-06. 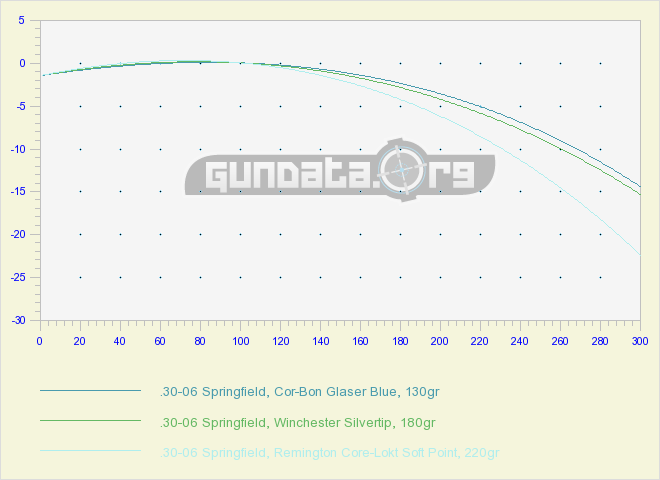 You can see in the chart above that the 30-06 and the 270 fly nearly indentical with the same gr, same style, and same manufacturing standards. In fact you might not be able to tell these are in fact 2 seperate trajectory lines until you get to the 420 yd line. What the trajectory chart doesn't show however is the energy. Under 150 yards the 30-06 packs a bigger punch, but after the 100 yard mark the 270 Win has a bigger punch. (at least in this example). At the 500 yard mark the 270 has about 15% more power than the 30-06, but who shoots deer at 500 yards anyway? The drop is something like 54" or 4 and 1/2 feet? If you want a gun that will kill deer and large game up to 500 yards get the 270 Win. If you want a rifle that has huge round variations then choose the 30-06. Both of these rounds are perfect for deer up to 200 yards. You would be better served to just pick one and spend your time at the range improving your shot rather than fretting over the scientific data. Pick a cartridge, get a rifle, and get out there and shoot something. We hope this has been of some use, thanks for reading!